What is the Lesson Challenge? SoftChalk users are truly some of the most innovative educators in the world of online learning. 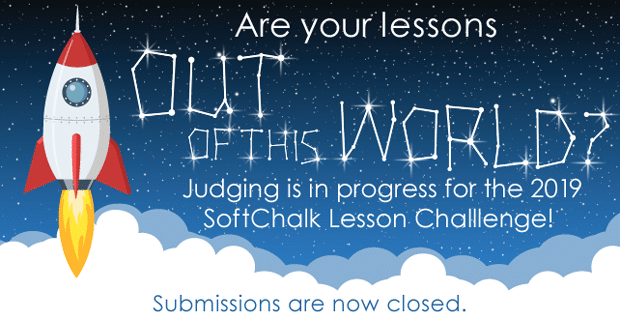 For the past nine years SoftChalk has held the Lesson Challenge to recognize and showcase the outstanding lessons you work so hard to create for your students and to recognize you for your creativity! Submissions for the 2019 SoftChalk Lesson Challenge will be accepted from 9am (Eastern Time) Friday, December 7 through 11:59pm (Eastern Time) Friday, February 22, 2019. A committee of educators will review all entries and award prizes (See 2019 Judging Rubric). Winners will be notified by Monday, May 6, 2019. How do I submit my Lessons? If you already have a SoftChalk Cloud account, follow these steps to submit your publicly shared lessons to the 2019 SoftChalk Lesson Challenge. Log into your SoftChalk Cloud account. Go to My Content/ Lessons and click the lesson you wish to enter into the Lesson Challenge. Verify the content on the entry form and click Submit. Entering lessons created with SoftChalk 9 ,10 or 11 (desktop) or through SoftChalk Private Cloud. Open your lesson, and choose File/Save to SoftChalk Cloud. IMPORTANT: For the Privacy option, be sure to designate Public so that your lesson can be viewed and judged for the Lesson Challenge. Continue to Step 3 to submit your lesson to the Lesson Challenge. Go to My Content/ My Lessons & Courses page and click on the lesson you wish to enter. Under the Lesson Actions section, click on the Enter Lesson Challenge link. 1st place will receive a cash prize of $600. 2nd place will receive $500. 3rd place will receive $400. All three winners will also receive a trophy and bragging rights of course! Q: Can I submit more than one lesson? A: Yes! You can submit up to 3 lessons. Q: If my lesson is already in SoftChalk Cloud, do I need to resubmit it? A: If you have already saved your lesson in SoftChalk Cloud, you do not need to resubmit it. Just look for the Enter Lesson Challenge link under the Lesson Actions section.